Love is, if celluloid is to be believed, the realm of young star-crossed lovers and those on the cusp of mid-life crises. The representation of youthful love is often accompanied by the intense passion of the first love, and the parental figures with whom they will undoubtedly clash. Middle-aged representations of love are acutely different incorporating a unique undercurrent of pessimism, the desire to end an elongated period loneliness and be married before the dreaded 40. But what of the eldest generation? By and large they tend to be ignored in the romance genre. 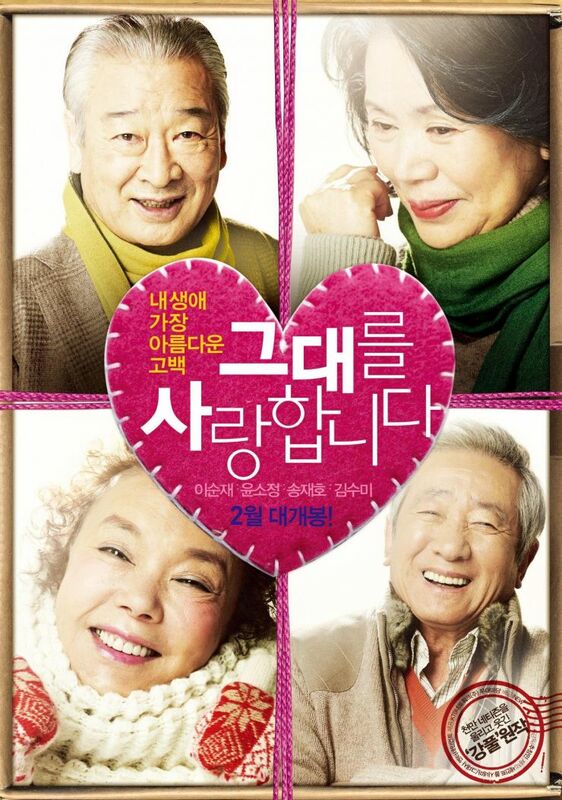 Choo Chang-min‘s (추창민) Late Blossom (그대를 사랑합니다) helps to remedy the imbalance, offering deeply poignant and deeply romantic narratives featuring senior citizens. Kim Man-seok (Lee Soon-jae (이순재) is a foul-tempered and foul-mouthed milk courier who traverses the narrow alleyways of his neighbourhood on his trusty moped. One winter Man-seok passes Song I-ppoon (Yoon So-jeong (윤소정), a poor woman of a similar age struggling to make ends meet by collecting cardboard and plastic. In spite of his ill-tempered disposition, Man-seok attempts to help her in the difficult icy conditions. Though annoyed, he finds himself drawn to Song and every morning waits to help her and his temperament gradually dissipates. 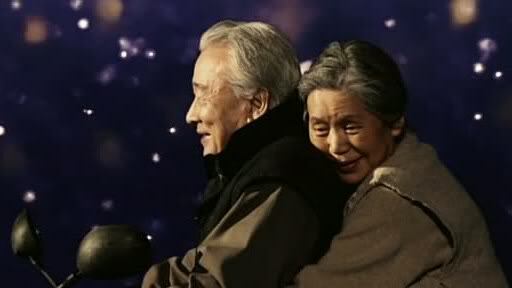 In the same neighbourhood are another elderly couple, Jang Goon-bong (Song Jae-ho (송재호) and his wife (Kim Soo-mi (김수미). Goon-bong works all hours at the local parking lot while his Alzheimer’s suffering spouse stays home. That is, until one day Goon-bong forgets to lock the gate and she escapes, later bumping into Man-seok at the local park which sets off a chain of events that will bring the unlikely quartet together and in the process rediscover themselves. Late Blossom is a delicately crafted, wonderfully poignant romantic tale. Screenwriters Choo Chang-min, Kim Sang-soo, Kim Yong-deok, and Lee Man-hee have carefully constructed an emotionally charged and heartwarming narrative that never feels forced. The way the relationships develop are subtle and organic, employing psychoanalytic depth to each protagonist amid the issues faced by senior citizens. Additionally, the mise-en-scene is sublime. Director Choo Chang-min uses the landscape to great effect, capturing the claustrophobic environment of the run-down old houses and the narrow labyrinthine streets. The town itself is situated on a mountain slope allowing for a variety of angled shots that highlight the change in power status between the central protagonists and the other inhabitants. The framing is also incredibly impressive serving to be both social-realist during the more bleak moments, and whimsically romantic in the melodramatic segments. Just as Late Blossom is technically impressive, the acting is also very effective. While all the performances are competent, Lee Soon-jae and Kim Soo-mi are remarkable. As an Alzheimer’s patient, Kim Soo-mi evokes a multitude of emotions which earned her the Best Supporting Actress award at the 32nd Blue Dragon Awards. She conveys empathy, humour, mental illness and in rare moments of translucency, deeply moving sentiment. Lee Soon-jae is also wonderful as ill-tempered Man-seok, who gradually evolves due to his belated encounter with love. The narrative is mostly concerned with his evolution of character, which is a shame considering the additional talent involved, but Lee Soon-jae’s performance is so poignant that the narrative is consistently entertaining. Yoon So-jeong is restrained and subtle as illiterate Song I-ppoon, whose poverty-stricken life has beaten her into despair. Similarly, Song Jae-ho is wonderful as caring husband Goon-bong. His unselfish motivations are perhaps the most romantic within Late Blossom, convey adoration and heartache for his wife. Late Blossom is a wonderfully moving film, conveying romance and dilemmas for an often under-represented generation. It is thought-provoking and poignant, eschewing the cliches often ascribed to more generic examples that are arguably naive in their representations of love. That said, the narrative is not equally shared amongst the quartet of protagonists which is a shame, as the character development is somewhat stifled for certain members. However, Late Blossom is not only an incredible example of the genre, but amongst the best in representing romance for senior members of society.